It just occurred to me that August is next week, which means school is starting ridiculously soon. I think I'm going to start Lincoln on some sort of homeschool preschool program this fall, but I have yet to get anything organized! I had better get to it. Since he is not going to a traditional school, we don't have a supply list to purchase, but I know that I would love to spruce up our collection of art supplies and writing utensils. School expenses can really add up and cause a lot of financial stress. So, I decided to team up with some amazing bloggers and host an awesome giveaway! 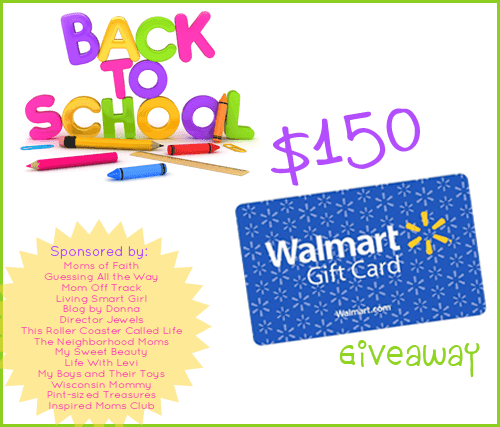 What better way to kick off the new school year than to have a back to school $150 Walmart gift card giveaway?! I don't know about you, but $150 would do a lot for our preschool supply wish list! Please stop by and show all of these fabulous ladies some blog love! One reader will win a $150 Gift Card to Walmart! This giveaway will end on August 18. This giveaway is open to Continental US, Hawaii, Alaska, and Canada. If winner chosen is in Hawaii, Alaska, or Canada, they will receive an e-gift card instead of one via snail mail. Disclaimer: Walmart is not affiliated with this giveaway or its sponsors. Prize is being provided by sponsors mentioned above. My favorite was always music. Anything music. Music appreciation, music theory, band, choir... I had two classes of choir a day my last two years of high school. Music was definitely my favorite subject. But Debate was 2nd favorite followed by Drama....followed by English. I loved school! My favorite subject in school was definitely science! Love that stuff! My favorite subject in high school was accounting. I liked science the best in school. English was always my favorite subject because I loved to read. My favorite subject was Social Studies--still is! I absolutely loved all of my science classes. my favorite subject waslunch and p.e. I was a nerd, I liked every subject! I also had amazing teachers that made every class awesome! I think out of all of the classes I took throughout school, including college, the only class I didn't like was Economics. I always liked geography and history classes. English and Geography were both favorites of mine. I loved music and history. My favorite school subject was math, i think cause it always came so easy to me. Bailey Dexter I love the art classes. There is something to be said about the history of it all! Math, Reading, and Art! They were my favorite lol. Geography. I was always interested in other countries. Math - I actually got 796 on my math SAT'so -- out of 800! I think it was MATH all the way through. I loved lunch and recess but being serious I would have to say I loved math until Algebra. I loved music. I was really surprised that neither of my kids has shown any interest in learning an instrument. My daughter likes guitar, but no band.